UC San Diego Center for Community Health works across a variety of policy areas and topic issues, collaborating with community residents, partner agencies, businesses, healthcare and local government to develop, adopt and implement policies that support health and wellness. Public health policies readily influence the health and wellness of our community and are designed to address health outcomes and health inequities. Policy is often related solely to legislation, but public health policy can also be used to describe regulations, procedures, administrative actions, organizational positions, or courses of action. 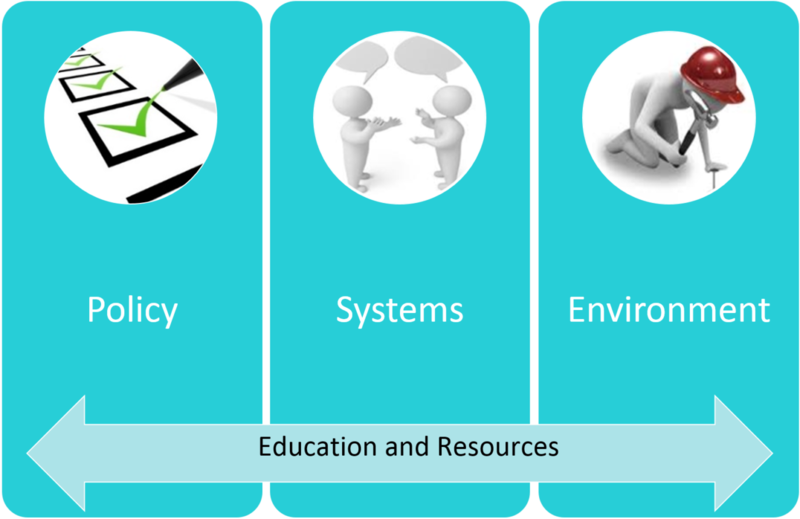 The Center for Community Health utilizes a sustainable model to inform policy work including system and environmental changes coupled with education and supplementary resources to promote implementation and execution of successful policies. Healthy Food in Every Neighborhood: A Policy Scan of Local Jurisdictions in San Diego County is produced by ChangeLab Solutions in partnership with the University of California, San Diego Center for Community Health. The report identifies three key policy strategies (farmers’ markets, community agriculture, and healthy government procurement policies) jurisdictions can deploy to improve the environment in which people purchase food. The report reviews general plan and municipal code policies in all 18 incorporated cities in San Diego County, as well as the County of San Diego (19 jurisdictions total). This tool is intended to stimulate discussion about different policy options for improving healthy food access across San Diego County. The Center for Community Health works with schools, retailers, worksites, and faith-based organizations to develop and implement policies that support healthy lifestyle habits such as healthy eating and increased physical activity. See below for some examples of institutional wellness policies and practices. Many projects work to increase access to physical activity which can have many benefits for the organization and the people they serve. For example, the Faith-Based Wellness program worked with the Copley-Price Family YMCA to expand the days and hours of the Women Only Swimming Program to accommodate Muslim modesty. Healthy food policies have been developed in many of the Center’s sites to demonstrate the commitment and support of the organization’s leadership to health and wellness. For example both the Live Well @ Work Initiative and the Faith-Based Wellness program have implemented Healthy Meeting Policies to encourage organizations to provide healthy food and drink options during meetings, events, and services. In addition, the Live Well @ Work Initiative has worked with employers to execute Healthy Vending Policies to offer healthy options in onsite vending machines. See below resources for examples. Find out more about your San Diego County district’s Local School Wellness Policy – and sample language for particular school wellness initiatives – by clicking on the appropriate district or strategy. Policies that support the initiation and duration of breastfeeding have many benefits not only for mothers and babies, but for businesses and society. The Center for Community Health’s Lactation Supportive Environments (LSE) project works with businesses, school districts and community healthcare centers to support the adoption of lactation accommodation policies for employees. LSE works with Human Resource professionals to provide initial assessments, information on state and federal laws, sample policy language, assistance in creating and/or updating policies and procedures, lactation room design support, training and customized resources for both employees and employers. Writing and adopting a policy can be a lengthy process, especially for school districts. Providing sample policy language and assistance can help move things along. To address this issue, the Center for Community Health collaborated with the California School Boards Association and the County Office of Education to develop a sample lactation accommodation policy, BP 4033, which can be utilized by all school districts in California. While a model policy template exists for schools no single sample policy exists or is relevant for every business so the LSE project provides sample language and technical assistance to draft lactation accommodations suitable for the unique needs of each business. Urban agriculture policies often focus on strategies for improving access to healthy food. The Center for Community Health works with local retailers, organizations and city governments to increase access and affordability to healthy foods throughout San Diego County. Below are some examples of the Center’s work. The Healthy Retail program in collaboration with the County of San Diego Health and Human Services Agency is currently working on developing a Healthy Jurisdiction Policy with National City. The policy will work to promote local businesses while increasing access to healthy food for local residents.